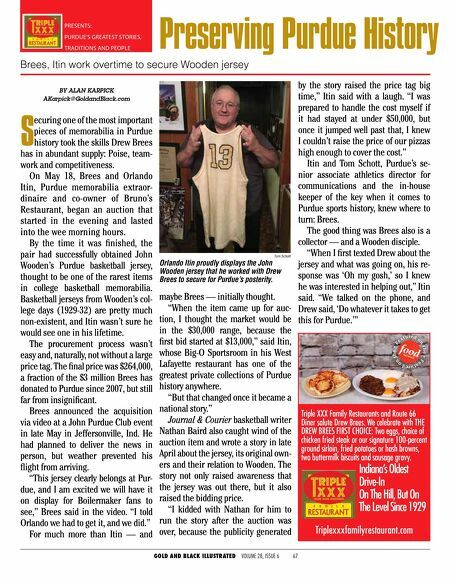 GOLD AND BLACK ILLUSTRATED VOLUME 28, ISSUE 6 66 P U R D U E F O O T B A L L L O C K E R C A M P A I G N PICTURE YOURSELF AS PART OF THE NEW ERA OF PURDUE FOOTBALL Join this exclusive opportunity and support the Purdue Football Locker Campaign. John Purdue Club members, like yourself, will provide critical support for current student-athletes and will receive the opportunity to name a locker within the new locker room at the Football Performance Complex. Act fast and make your mark with Purdue Athletics by sponsoring a locker today! HOW IT WORKS • The naming right for each locker is $12,500, payable over five years. • Lockers are available on a first-come, first-served basis until all 120 lockers are reserved. • Each locker will be allocated by the date in which commitments are received. • Lockers will be chosen at random and the naming plaque can include donor name(s) and 'in honor of' or 'in memory of' recognition. 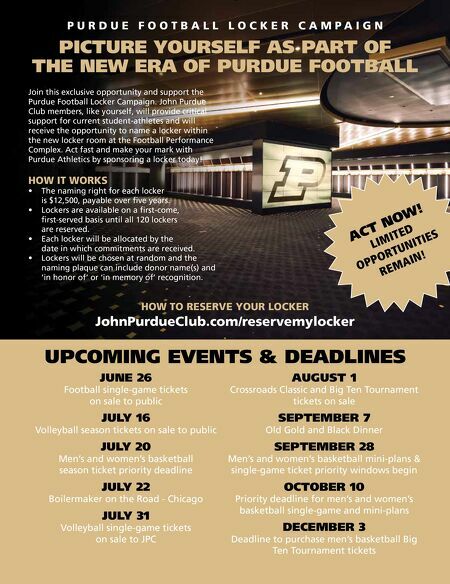 HOW TO RESERVE YOUR LOCKER JohnPurdueClub.com/reservemylocker UPCOMING EVENTS & DEADLINES JUNE 26 Football single-game tickets on sale to public JULY 16 Volleyball season tickets on sale to public JULY 20 Men's and women's basketball season ticket priority deadline JULY 22 Boilermaker on the Road - Chicago JULY 31 Volleyball single-game tickets on sale to JPC AUGUST 1 Crossroads Classic and Big Ten Tournament tickets on sale SEPTEMBER 7 Old Gold and Black Dinner SEPTEMBER 28 Men's and women's basketball mini-plans & single-game ticket priority windows begin OCTOBER 10 Priority deadline for men's and women's basketball single-game and mini-plans DECEMBER 3 Deadline to purchase men's basketball Big Ten Tournament tickets ACT NOW! LIMITED OPPORTUNITIES REMAIN!